There are no complete analogues, see other antihistamines . 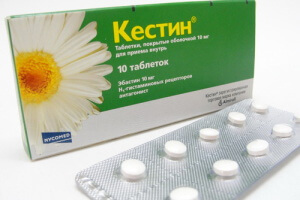 Kestin (international name - Ebastin) is an antiallergic drug from the group of H1-receptor blockers, which has a long lasting effect and is generally well tolerated by the body. conditions associated with increased production of histamine in the body. 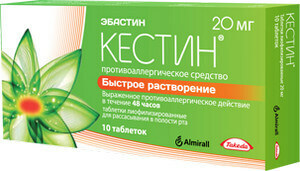 White tablets in the shell, sold in blisters of 5 or 10 pcs., The main active ingredient - ebastine. Excipients: microcrystalline cellulose, corn starch, lactose monohydrate, structured sodium carboxymethylcellulose. 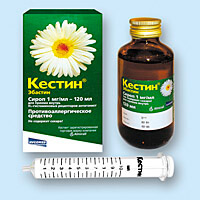 Syrup in dark color bottles (60 or 120 ml) with a dosing syringe, the main active ingredient is ebastine. Auxiliary substances: glycerol oxystearate, lactic acid, neohesperidin didrochalkon, anethol, sodium propyl parahydroxybenzoate and methyl parahydroxybenzoate, glycerin, sorbitol solution, dimethyl polysiloxane, sodium hydroxide, distilled water. If the patient has liver failure, a single dose should be no more than 5-10 mg (regardless of age), which is ½-1 tablet or 5-10 ml of syrup. age up to 6 years. In addition, the tool should be used with caution in liver or kidney failure. At therapeutic doses, Kestin usually does not cause side effects and has a minimal effect on the ability of patients to drive vehicles, engage in hazardous activities, as well as those that require increased concentration. In some cases, after taking the drugs, patients may experience headache, drowsiness or insomnia, dry mouth, abdominal pain, diarrhea; in addition, they may develop rhinitis, sinusitis and asthenia. When taking the drug in therapeutic doses, overdose is impossible. 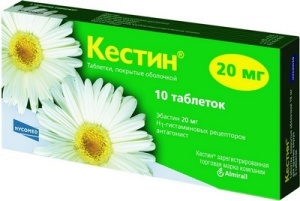 If a large amount of Kestin was taken by chance, the patient requires gastric lavage, symptomatic therapy and control of important body functions. The drug is compatible with indirect coagulants, theophylline, diazepam, cimetidine and ethanol-containing drugs. Not recommended in conjunction with erythromycin and ketoconazole . Kestin can affect the results of skin allergy tests, so they are recommended to be carried out at least 5-7 days after cancellation. The drug affects the histamine receptors type H 1 through competitive inhibition. By binding to free receptors, it helps stop allergic reactions, prevents smooth muscle spasms and vascular permeability caused by histamine. The drug is rapidly absorbed by the liver, so that a pronounced antihistamine effect begins after 1 hour and lasts at least 48 hours. After a five-day course of Kestin, his activity persists for 72 hours. About 60-70% of the active substance is excreted by the kidneys as conjugates. It is released without a prescription. Store at a temperature not exceeding 30 degrees, in a place protected from sunlight and out of reach of children. Shelf life - 3 years.